It’s those kinds of sounds that Ghosts on Tape (a.k.a. Ryan Merry) assembles on his dual Yamaha SU700 samplers. Although the ’90s-era machines are undeniably antiquated—new sounds literally have be loaded on the fly via floppy disk—he’s thoroughly mastered these vintage weapons, crafting raw and trippy tunes that combine the ominous underbelly of classic house and techno with upfront, bass-heavy futurism. Those sonic principles also drive ICEE HOT, the influential monthly party (and newly formed record label) in San Francisco which Ghosts on Tape co-founded and where he continues to serve as a resident DJ. A native of St. Louis, Ghosts on Tape relocated to San Francisco in 2003 and began garnering attention for his blistering DJ and live sets and the warped, slow-motion house and bass sounds he was creating. His 2009 Predator Mode EP on Wireblock exploded Ghosts on Tape’s profile even further, as did an exclusive mix for Mary Anne Hobbs’ BBC Radio 1 show, as well as compilation appearances and remixes for labels such as Planet Mu, Tigerbeat6, Frite Nite, Shockout, True Panther, Friends Of Friends, and Opit, among others. In 2011, he was selected to be a participant at the Red Bull Music Academy in Madrid. His sound has evolved over the years, gradually pushing up the tempo back towards his Midwestern house and techno roots, but one thing hasn’t changed: Ghosts on Tape likes raving. 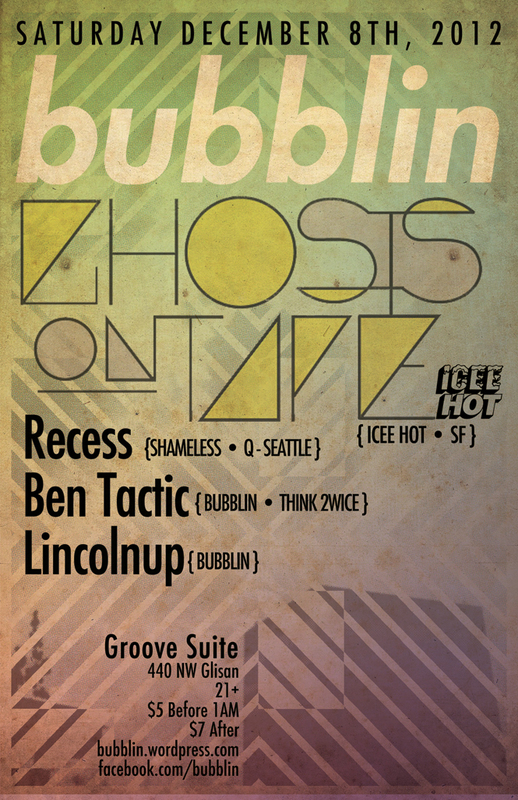 Recess has been in a long term love affair with Seattle’s underground music scene for the past couple of decades. In the late 80′s he found his second home at the long defunct Club Underground in Seattle’s University District (along with DJ Dominator aka Donald Glaude, DJ Dan and many others). During the 90s he bounced between raves, rock shows and jazz clubs appreciating the passion and community behind the scenes. Using these early experiences as a platform, he started collecting records and honing his skills at various clubs around the Northwest; quickly establishing himself as a formidable performer. In 2003 he founded Shameless Productions (responsible for numerous legendary underground club nights, parties and shenanigans). Along with a changing cast of players, over the years, Shameless established itself as a trust worthy brand by throwing some of the most memorable events for Seattle’s undergound dance music community. From day one, each Shameless party was a special one regardless of the wide ranges of genres and bookings represented. With an eye towards the cutting edge, but deep respect for electronic music’s rich history, Shameless has kept it’s finger on the pulse of Seattle’s underground for close to ten years. (Check out the video clip of the 2010 Shameless Anniversary Party for a taste… http://youtu.be/xjG7Dxyv8dg ). In 2006 Recess was nominated as one of Seattle Weekly’s best local DJs. His DJ sets often reflect Shameless’ aesthetic by focusing on forward thinking music while cherishing the gems of the past. He’ll span the various sub genres of house/disco music, and may weave through techno, bass and funky depending upon the party. He’s also been known to throw down a rump shaking ghettotech/booty house set at times. As an example of his range, over the years he has rocked parties with Green Velvet, Egyptian Lover, Modeselektor, Claude Von Stroke, DJ Assault, Boys Noize, MSTRKRFT, Damian Lazarus, Smash TV, Drop the Lime, John Tejada and countless others across numerous electronic music genres. His range, passion and deep understanding of the dancefloor has made him a longtime favorite underground club DJ in Seattle and the greater Northwest. Whether it’s an afterhours loft space, major club, mountaintop, or random BASSment; Recess has consistently brought the sounds and energy to fit any dance party. This entry was posted on November 21, 2012 at 4:49 pm and is filed under Ben Tactic, Bubblin, Ghosts On Tape, Lincolnup, Recess. You can follow any responses to this entry through the RSS 2.0 feed. You can leave a response, or trackback from your own site.